Spring Gully Foods is now selling a new range of pickled vegetables with a ‘lift and drain’ basket included. The lift and drain basket sits inside the packaging and is designed to make it easy to separate the vegetables from the liquid they sit in, and to return unused vegetables to the juice for storage. Spring Gully’s factory in Dry Creek, South Australia, had to undergo significant re-engineering to accommodate the new packaging. 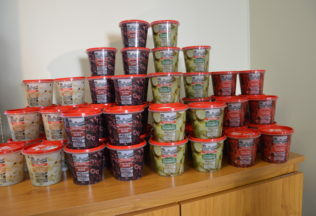 The new range includes cucumbers, onions, olives and capsicums, all of which will be Australian grown says Managing Director of Spring Gully, Kevin Webb. “We last processed Australian gherkins about 25 years ago when they were grown by commercial grape growers in the Adelaide Hills and Barossa Valley as a secondary crop,” Webb said. “Since then we have been sourcing them from overseas. However we recently signed a multi-year agreement with a large commercial market gardener at Virginia, north of Adelaide and will receive around 300 tonnes of fresh cucumbers this year. This volume is anticipated to increase year on year,” he stated. The pickle vegetables will come in 340g servings to be sold at Coles supermarkets. Recommended retail prices start from approximately AUD $6.00. Spring Gully Foods is a third-generation family owned company located in South Australia. The company produces pickled vegetables and relishes. It also owns the Leabrook Farms honey brand. In 2013, Spring Gully Foods entreated into voluntary administration but then received a private label contract from Coles which helped keep the business operational.